The discovery of the 118 chemical elements known to exist today is presented here in chronological order. The elements are listed generally in the order in which each was first defined as the pure element, as the exact date of discovery of most elements cannot be accurately defined. Given is each element's name, atomic number, year of first report, name of the discoverer, and some notes related to the discovery. 29 Copper 9000 BCE 6000 BCE Middle East Anatolia Copper was probably the first metal mined and crafted by humans. It was originally obtained as a native metal and later from the smelting of ores. Earliest estimates of the discovery of copper suggest around 9000 BCE in the Middle East. It was one of the most important materials to humans throughout the Chalcolithic and Bronze Ages. Copper beads dating from 6000 BCE have been found in Çatal Höyük, Anatolia. 82 Lead 7000 BCE 3800 BCE Africa Abydos, Egypt It is believed that lead smelting began at least 9,000 years ago, and the oldest known artifact of lead is a statuette found at the temple of Osiris on the site of Abydos dated circa 3800 BCE. 79 Gold Before 6000 BCE ca. 4400 BCE Bulgaria Varna Necropolis The oldest golden treasure in the world, dating from 4,600 BC to 4,200 BC, was discovered at the burial site Varna Necropolis. 26 Iron Before 5000 BCE 4000 BCE Unknown; see History of ferrous metallurgy Egypt There is evidence that iron was known from before 5000 BCE. The oldest known iron objects used by humans are some beads of meteoric iron, made in Egypt in about 4000 BCE. The discovery of smelting around 3000 BCE led to the start of the iron age around 1200 BCE and the prominent use of iron for tools and weapons. 50 Tin 3500 BCE 2000 BCE Unknown; see Tin#History First smelted in combination with copper around 3500 BCE to produce bronze. The oldest artifacts date from around 2000 BCE. 30 Zinc Before 1000 BCE 1000 BCE Indian metallurgists Indian subcontinent Extracted as a metal since antiquity (before 1000 BCE) by Indian metallurgists, but the true nature of this metal was not understood in ancient times. Identified as a unique metal by the metallurgist Rasaratna Samuccaya in 800 and by the alchemist Paracelsus in 1526. Isolated by Andreas Sigismund Marggraf in 1746. 33 Arsenic 2500 BCE/1250 CE Bronze age A. Magnus In use in the early bronze age; Albertus Magnus was the first European to isolate the element in 1250. In 1649, Johann Schröder published two ways of preparing elemental arsenic. 51 Antimony 3000 BCE In widespread use in Egypt and the Middle East. 15 Phosphorus 1669 1669 H. Brand H. Brand Prepared from urine, it was the first element to be chemically discovered. 27 Cobalt 1732 G. Brandt Proved that the blue color of glass is due to a new kind of metal and not bismuth as thought previously. 78 Platinum 1748 1748 A. de Ulloa A. de Ulloa First description of a metal found in South American gold was in 1557 by Julius Caesar Scaliger. Ulloa published his findings in 1748, but Sir Charles Wood also investigated the metal in 1741. First reference to it as a new metal was made by William Brownrigg in 1750. 28 Nickel 1751 1751 F. Cronstedt F. Cronstedt Found by attempting to extract copper from the mineral known as fake copper (now known as niccolite). 12 Magnesium 1755 1808 J. Black H. Davy Black observed that magnesia alba (MgO) was not quicklime (CaO). Davy isolated the metal electrochemically from magnesia. 2 from other gases, although Paracelsus around 1500, Robert Boyle, and Joseph Priestley had observed its production by reacting strong acids with metals. Lavoisier named it in 1793. 8 Oxygen 1771 1771 W. Scheele W. Scheele Obtained it by heating mercuric oxide and nitrates in 1771, but did not publish his findings until 1777. Joseph Priestley also prepared this new air by 1774, but only Lavoisier recognized it as a true element; he named it in 1777. 7 Nitrogen 1772 1772 D. Rutherford D. Rutherford He discovered Nitrogen while he was studying at the University of Edinburgh. He showed that the air in which animals had breathed, even after removal of the exhaled carbon dioxide, was no longer able to burn a candle. Carl Wilhelm Scheele, Henry Cavendish, and Joseph Priestley also studied the element at about the same time, and Lavoisier named it in 1775-6. 56 Barium 1772 1808 W. Scheele H. Davy Scheele distinguished a new earth (BaO) in pyrolusite and Davy isolated the metal by electrolysis. 17 Chlorine 1774 1774 W. Scheele W. Scheele Obtained it from hydrochloric acid, but thought it was an oxide. Only in 1808 did Humphry Davy recognize it as an element. 25 Manganese 1774 1774 W. Scheele G. Gahn Distinguished pyrolusite as the calx of a new metal. Ignatius Gottfred Kaim also discovered the new metal in 1770, as did Scheele in 1774. It was isolated by reduction of manganese dioxide with carbon. 42 Molybdenum 1778 1781 W. Scheele J. Hjelm Scheele recognised the metal as a constituent of molybdena. 74 Tungsten 1781 1783 W. Scheele J. and F. Elhuyar Scheele obtained from scheelite an oxide of a new element. The Elhuyars obtained tungstic acid from wolframite and reduced it with charcoal. 38 Strontium 1787 1808 W. Cruikshank H. Davy Cruikshank and Adair Crawford in 1790 concluded that strontianite contained a new earth. It was eventually isolated electrochemically in 1808 by Humphry Davy. 40 Zirconium 1789 1824 H. Klaproth J. Berzelius Klaproth identified a new element in zirconia. 92 Uranium 1789 1841 H. Klaproth E.-M. Péligot Klaproth mistakenly identified a uranium oxide obtained from pitchblende as the element itself and named it after the recently discovered planet Uranus. 22 Titanium 1791 1825 W. Gregor J. Berzelius Gregor found an oxide of a new metal in ilmenite; Martin Heinrich Klaproth independently discovered the element in rutile in 1795 and named it. The pure metallic form was only obtained in 1910 by Matthew A. Hunter. 39 Yttrium 1794 1843 J. Gadolin G. Mosander Discovered in gadolinite, but Mosander showed later that its ore, yttria, contained more elements. 24 Chromium 1797 1798 N. Vauquelin N. Vauquelin Vauquelin discovered the trioxide in crocoite ore, and later isolated the metal by heating the oxide in a charcoal oven. 4 Beryllium 1798 1828 N. Vauquelin F. Wöhler and A. Bussy Vauquelin discovered the oxide in beryl and emerald, and Klaproth suggested the present name around 1808. 23 Vanadium 1801 1830 M. del Río N.G.Sefström Río found the metal in vanadinite but retracted the claim after Hippolyte Victor Collet-Descotils disputed it. Sefström isolated and named it, and later it was shown that Río had been right in the first place. 41 Niobium 1801 1864 C. Hatchett W. Blomstrand Hatchett found the element in columbite ore and named it columbium. Heinrich Rose proved in 1844 that the element is distinct from tantalum, and renamed it niobium which was officially accepted in 1949. 46 Palladium 1803 1803 H. Wollaston H. Wollaston Wollaston discovered it in samples of platinum from South America, but did not publish his results immediately. He had intended to name it after the newly discovered asteroid, Ceres, but by the time he published his results in 1804, cerium had taken that name. Wollaston named it after the more recently discovered asteroid Pallas. 58 Cerium 1803 1838 H. Klaproth, J. Berzelius, and W. Hisinger G. Mosander Berzelius and Hisinger discovered the element in ceria and named it after the newly discovered asteroid (then considered a planet), Ceres. Klaproth discovered it simultaneously and independently in some tantalum samples. Mosander proved later that the samples of all three researchers had at least another element in them, lanthanum. 76 Osmium 1803 1803 S. Tennant S. Tennant Tennant had been working on samples of South American platinum in parallel with Wollaston and discovered two new elements, which he named osmium and iridium. 77 Iridium 1803 1803 S. Tennant S. Tennant Tennant had been working on samples of South American platinum in parallel with Wollaston and discovered two new elements, which he named osmium and iridium, and published the iridium results in 1804. 45 Rhodium 1804 1804 H. Wollaston H. Wollaston Wollaston discovered and isolated it from crude platinum samples from South America. 19 Potassium 1807 1807 H. Davy H. Davy Davy discovered it by using electrolysis on potash. 11 Sodium 1807 1807 H. Davy H. Davy Andreas Sigismund Marggraf recognised the difference between soda and potash in 1758. Davy discovered sodium a few days after potassium, by using electrolysis on sodium hydroxide. 20 Calcium 1808 1808 H. Davy H. Davy Davy discovered the metal by electrolysis of quicklime. 5 Boron 1808 1808 L. Gay-Lussac and L.J. Thénard H. Davy Radical boracique appears on the list of elements in Lavoisier's Traité Élémentaire de Chimie from 1789. On June 21, 1808, Lussac and Thénard announced a new element in sedative salt, Davy announced the isolation of a new substance from boracic acid on June 30. 9 Fluorine 1810 1886 A.-M. Ampère H. Moissan Radical fluorique appears on the list of elements in Lavoisier's Traité Élémentaire de Chimie from 1789, but radical muriatique also appears instead of chlorine. 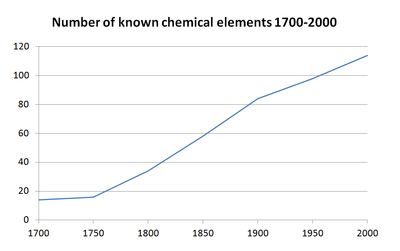 André-Marie Ampère predicted an element analogous to chlorine obtainable from hydrofluoric acid, and between 1812 and 1886 many researchers tried to obtain this element. It was eventually isolated by Moissan. 53 Iodine 1811 1811 B. Courtois B. Courtois Courtois discovered it in the ashes of seaweed. 3 Lithium 1817 1821 A. Arfwedson W. T. Brande Arfwedson discovered the alkali in petalite. 48 Cadmium 1817 1817 S. L Hermann, F. Stromeyer, and J.C.H. Roloff S. L Hermann, F. Stromeyer, and J.C.H. Roloff All three found an unknown metal in a sample of zinc oxide from Silesia, but the name that Stromeyer gave became the accepted one. 34 Selenium 1817 1817 J. Berzelius and G. Gahn J. Berzelius and G. Gahn While working with lead they discovered a substance that they thought was tellurium, but realized after more investigation that it is different. 14 Silicon 1823 1823 J. Berzelius J. Berzelius Humphry Davy thought in 1800 that silica was a compound, not an element, and in 1808 suggested the present name. In 1811 Louis-Joseph Gay-Lussac and Louis-Jacques Thénard probably prepared impure silicon, but Berzelius is credited with the discovery for obtaining the pure element in 1823. 13 Aluminium 1825 1825 H.C.Ørsted H.C.Ørsted Antoine Lavoisier predicted in 1787 that alumine is the oxide of an undiscovered element, and in 1808 Humphry Davy tried to decompose it. Although he failed, he suggested the present name. Hans Christian Ørsted was the first to isolate metallic aluminium in 1825. 35 Bromine 1825 1825 J. Balard and C. Löwig J. Balard and C. Löwig They both discovered the element in the autumn of 1825. Balard published his results the next year, but Löwig did not publish until 1829. 90 Thorium 1829 1914 J. Berzelius D. Lely, Jr. and L. Hamburger Berzelius obtained the oxide of a new earth in thorite. 57 Lanthanum 1838 1841 G. Mosander G. Mosander Mosander found a new element in samples of ceria and published his results in 1842, but later he showed that this lanthana contained four more elements. 68 Erbium 1843 1879 G. Mosander T. Cleve Mosander managed to split the old yttria into yttria proper and erbia, and later terbia too. 65 Terbium 1843 1886 G. Mosander J.C.G. de Marignac Mosander managed to split the old yttria into yttria proper and erbia, and later terbia too. 44 Ruthenium 1844 1844 K. Claus K. Claus Gottfried Wilhelm Osann thought that he found three new metals in Russian platinum samples, and in 1844 Karl Karlovich Klaus confirmed that there was a new element. 55 Caesium 1860 1882 R. Bunsen and R. Kirchhoff C. Setterberg Bunsen and Kirchhoff were the first to suggest finding new elements by spectrum analysis. They discovered caesium by its two blue emission lines in a sample of Dürkheim mineral water. The pure metal was eventually isolated in 1882 by Setterberg. 37 Rubidium 1861 R. Bunsen and G. R. Kirchhoff R. Bunsen Bunsen and Kirchhoff discovered it just a few months after caesium, by observing new spectral lines in the mineral lepidolite. Bunsen never obtained a pure sample of the metal, which was later obtained by Hervesy. 81 Thallium 1861 1862 W. Crookes C.-A. Lamy Shortly after the discovery of rubidium, Crookes found a new green line in a selenium sample; later that year, Lamy found the element to be metallic. 49 Indium 1863 1867 F. Reich and T. Richter T. Richter Reich and Richter First identified it in sphalerite by its bright indigo-blue spectroscopic emission line. Richter isolated the metal several years later. 2 Helium 1868 1895 P. Janssen and N. Lockyer W. Ramsay, T. Cleve, and N. Langlet Janssen and Lockyer observed independently a yellow line in the solar spectrum that did not match any other element. 70 Ytterbium 1878 1906 J.C.G. de Marignac C. A. von Welsbach On October 22, 1878, Marignac reported splitting terbia into two new earths, terbia proper and ytterbia. 67 Holmium 1878 1879 J.-L. Soret T. Cleve Soret found it in samarskite and later, Per Teodor Cleve split Marignac's erbia into erbia proper and two new elements, thulium and holmium. 69 Thulium 1879 1879 T. Cleve T. Cleve Cleve split Marignac's erbia into erbia proper and two new elements, thulium and holmium. 21 Scandium 1879 1879 F. Nilson F. Nilson Nilson split Marignac's ytterbia into pure ytterbia and a new element that matched Mendeleev's 1871 predicted eka-boron. 62 Samarium 1879 1879 P.E.L. de Boisbaudran P.E.L. de Boisbaudran Boisbaudran noted a new earth in samarskite and named it samaria after the mineral. 64 Gadolinium 1880 1886 J. C. G. de Marignac P.E.L. de Boisbaudran Marignac initially observed the new earth in terbia, and later Boisbaudran obtained a pure sample from samarskite. 59 Praseodymium 1885 C. A. von Welsbach Von Welsbach discovered two new distinct elements in Mosander's didymia: praseodymium and neodymium. 60 Neodymium 1885 C. A. von Welsbach Von Welsbach discovered two new distinct elements in Mosander's didymia: praseodymium and neodymium. 18 Argon 1894 1894 Lord Rayleigh and W. Ramsay Lord Rayleigh and W. Ramsay They discovered the gas by comparing the molecular weights of nitrogen prepared by liquefaction from air and nitrogen prepared by chemical means. It is the first noble gas to be isolated. 63 Europium 1896 1901 E.-A. Demarçay E.-A. Demarçay Demarçay found spectral lines of a new element in Lecoq's samarium, and separated this element several years later. 36 Krypton 1898 1898 W. Ramsay and W. Travers W. Ramsay and W. Travers On May 30, 1898, Ramsay separated a noble gas from liquid argon by difference in boiling point. 10 Neon 1898 1898 W. Ramsay and W. Travers W. Ramsay and W. Travers In June 1898 Ramsay separated a new noble gas from liquid argon by difference in boiling point. 54 Xenon 1898 1898 W. Ramsay and W. Travers W. Ramsay and W. Travers On July 12, 1898 Ramsay separated a third noble gas within three weeks, from liquid argon by difference in boiling point. 84 Polonium 1898 1902 P. and M. Curie W. Marckwald In an experiment done on July 13, 1898, the Curies noted an increased radioactivity in the uranium obtained from pitchblende, which they ascribed to an unknown element. 88 Radium 1898 1902 P. and M. Curie M. Curie The Curies reported on December 26, 1898, a new element different from polonium, which Marie later isolated from uraninite. 86 Radon 1899 1910 E. Rutherford and R. B. Owens W. Ramsay and R. Whytlaw-Gray Rutherford and Owens discovered a radioactive gas resulting from the radioactive decay of thorium, isolated later by Ramsay and Gray. In 1900, Friedrich Ernst Dorn discovered a longer-lived isotope of the same gas from the radioactive decay of radium. Since "radon" was first used to specifically designate Dorn's isotope before it became the name for the element, he is often mistakenly given credit for the latter instead of the former. 89 Actinium 1902 1902 F. O. Giesel F. O. Giesel Giesel obtained from pitchblende a substance that had properties similar to those of lanthanum and named it emanium. André-Louis Debierne had previously reported the discovery of a new element actinium that was supposedly similar to titanium and thorium; the elements were mistakenly identified as being identical and Debierne's name was chosen, even though in retrospect Debierne's substance could not have included much actual element 89. 71 Lutetium 1906 1906 C. A. von Welsbach and G. Urbain C. A. von Welsbach von Welsbach proved that the old ytterbium also contained a new element, which he named cassiopeium. Urbain also proved this simultaneously, but his samples were very impure and only contained trace quantities of the new element. Despite this, his chosen name lutetium was adopted. 75 Rhenium 1908 1919 M. Ogawa M. Ogawa Ogawa found it in thorianite but assigned it as element 43 instead of 75 and named it nipponium. In 1925 Walter Noddack, Ida Eva Tacke and Otto Berg announced its separation from gadolinite and gave it the present name. 91 Protactinium 1913 1927 O. H. Göhring and K. Fajans A. von Grosse The two obtained the first isotope of this element that had been predicted by Mendeleev in 1871 as a member of the natural decay of 238U. Originally isolated in 1900 by William Crookes, who nevertheless did not recognize that it was a new element. 72 Hafnium 1922 1922 D. Coster and G. von Hevesy D. Coster and G. von Hevesy Georges Urbain claimed to have found the element in rare-earth residues, while Vladimir Vernadsky independently found it in orthite. Neither claim was confirmed due to World War I, and neither could be confirmed later, as the chemistry they reported does not match that now known for hafnium. After the war, Coster and Hevesy found it by X-ray spectroscopic analysis in Norwegian zircon. Hafnium was the last stable element to be discovered. 43 Technetium 1937 1937 C. Perrier and E. Segrè C. Perrier & E.Segrè The two discovered a new element in a molybdenum sample that was used in a cyclotron, the first synthetic element to be discovered, though it was later found out that it does occur naturally in minuscule trace quantities. It had been predicted by Mendeleev in 1871 as eka-manganese. 61 Promethium 1942 1945 S. Wu, E.G. Segrè and H. Bethe Charles D. Coryell, Jacob A. Marinsky, Lawrence E. Glendenin, and Harold G. Richter It was probably first prepared in 1942 by bombarding neodymium and praseodymium with neutrons, but separation of the element could not be carried out. Isolation was performed under the Manhattan Project in 1945. 99 Einsteinium 1952 1952 A. Ghiorso et al. (Argonne Laboratory, Los Alamos Laboratory and University of California, Berkeley) Formed in the first thermonuclear explosion in November 1952, by irradiation of uranium with neutrons; kept secret for several years. 101 Mendelevium 1955 A. Ghiorso, G. Harvey, R. Choppin, S. G. Thompson and G. T. Seaborg Prepared by bombardment of einsteinium with helium. 103 Lawrencium 1961 A. Ghiorso, T. Sikkeland, E. Larsh and M. Latimer First prepared by bombardment of californium with boron atoms. 102 Nobelium 1966 E. D. Donets, V. A. Shchegolev and V. A. Ermakov First prepared by bombardment of uranium with neon atoms. 104 Rutherfordium 1969 A. Ghiorso, M. Nurmia, J. Harris, K. Eskola and P. Eskola Prepared by bombardment of californium with carbon atoms. 105 Dubnium 1970 A. Ghiorso, M. Nurmia, K. Eskola, J. Harris and P. Eskola Prepared by bombardment of californium with nitrogen atoms. 106 Seaborgium 1974 A. Ghiorso, J. Nitschke, J. Alonso, C. Alonso, M. Nurmia, G. T. Seaborg, K. Hulet and W. Lougheed Prepared by bombardment of californium with oxygen atoms. 110 Darmstadtium 1994 S. Hofmann et al. (GSI in Darmstadt) Prepared by bombardment of lead with nickel. 111 Roentgenium 1994 S. Hofmann et al. (GSI in Darmstadt) Prepared by bombardment of bismuth with nickel. ↑ "Copper History". Rameria.com. Archived from the original on 2008-09-17. Retrieved 2008-09-12. ↑ "The History of Lead – Part 3". Lead.org.au. Retrieved 2008-09-12. ↑ "Silver Facts – Periodic Table of the Elements". Chemistry.about.com. Retrieved 2008-09-12. ↑ Weeks, Mary Elvira; Leichester, Henry M. (1968). "Elements Known to the Ancients". Discovery of the Elements. Easton, PA: Journal of Chemical Education. pp. 29–40. ISBN 0-7661-3872-0. LCCCN 68-15217. ↑ "Notes on the Significance of the First Persian Empire in World History". Courses.wcupa.edu. Retrieved 2008-09-12. ↑ "History of Carbon and Carbon Materials – Center for Applied Energy Research – University of Kentucky". Caer.uky.edu. Retrieved 2008-09-12. ↑ Senese, Fred (September 9, 2009). "Who discovered carbon?". Frostburg State University. Retrieved 2007-11-24. ↑ "50 Tin". Elements.vanderkrogt.net. Retrieved 2008-09-12. ↑ "History of Metals". Neon.mems.cmu.edu. Retrieved 2008-09-12. ↑ "Sulfur History". Georgiagulfsulfur.com. Archived from the original on 2008-09-16. Retrieved 2008-09-12. ↑ "30 Zinc". Elements.vanderkrogt.net. Retrieved 2008-09-12. ↑ Weeks, Mary Elvira (1933). "III. Some Eighteenth-Century Metals". The Discovery of the Elements. Easton, PA: Journal of Chemical Education. p. 21. ISBN 0-7661-3872-0. 1 2 "Arsenic". Los Alamos National Laboratory. Retrieved 3 March 2013. ↑ SHORTLAND, A. J. (2006-11-01). "APPLICATION OF LEAD ISOTOPE ANALYSIS TO A WIDE RANGE OF LATE BRONZE AGE EGYPTIAN MATERIALS". Archaeometry. 48 (4): 657–669. doi:10.1111/j.1475-4754.2006.00279.x. ↑ "15 Phosphorus". Elements.vanderkrogt.net. Retrieved 2008-09-12. ↑ "27 Cobalt". Elements.vanderkrogt.net. Retrieved 2008-09-12. ↑ "78 Platinum". Elements.vanderkrogt.net. Retrieved 2008-09-12. ↑ "28 Nickel". Elements.vanderkrogt.net. Retrieved 2008-09-12. ↑ "Bismuth". Los Alamos National Laboratory. Retrieved 3 March 2013. ↑ "12 Magnesium". Elements.vanderkrogt.net. Retrieved 2008-09-12. ↑ "01 Hydrogen". Elements.vanderkrogt.net. Retrieved 2008-09-12. ↑ Andrews, A. C. (1968). "Oxygen". In Clifford A. Hampel. The Encyclopedia of the Chemical Elements. New York: Reinhold Book Corporation. p. 272. LCCN 68-29938. ↑ "08 Oxygen". Elements.vanderkrogt.net. Retrieved 2008-09-12. ↑ Cook, Gerhard A.; Lauer, Carol M. (1968). "Oxygen". In Clifford A. Hampel. The Encyclopedia of the Chemical Elements. New York: Reinhold Book Corporation. pp. 499–500. LCCN 68-29938. ↑ Roza, Greg (2010). The Nitrogen Elements: Nitrogen, Phosphorus, Arsenic, Antimony, Bismuth. p. 7. ISBN 9781435853355. ↑ "07 Nitrogen". Elements.vanderkrogt.net. Retrieved 2008-09-12. ↑ "56 Barium". Elements.vanderkrogt.net. Retrieved 2008-09-12. ↑ "17 Chlorine". Elements.vanderkrogt.net. Retrieved 2008-09-12. ↑ "25 Manganese". Elements.vanderkrogt.net. Retrieved 2008-09-12. ↑ "42 Molybdenum". Elements.vanderkrogt.net. Retrieved 2008-09-12. ↑ IUPAC. "74 Tungsten". Elements.vanderkrogt.net. Retrieved 2008-09-12. ↑ "52 Tellurium". Elements.vanderkrogt.net. Retrieved 2008-09-12. ↑ "38 Strontium". Elements.vanderkrogt.net. Retrieved 2008-09-12. 1 2 3 "Lavoisier 1789 - 33 elements". Elementymology & Elements Multidict. Retrieved 2015-01-24. ↑ "Chronology – Elementymology". Elements.vanderkrogt.net. Retrieved 2008-09-12. ↑ "Titanium". Los Alamos National Laboratory. 2004. Archived from the original on 2006-12-30. Retrieved 2006-12-29. ↑ Barksdale, Jelks (1968). The Encyclopedia of the Chemical Elements. Skokie, Illinois: Reinhold Book Corporation. pp. 732–38 "Titanium". LCCCN 68-29938. ↑ "04 Beryllium". Elements.vanderkrogt.net. Retrieved 2008-09-12. ↑ "23 Vanadium". Elements.vanderkrogt.net. Retrieved 2008-09-12. ↑ "41 Niobium". Elements.vanderkrogt.net. Retrieved 2008-09-12. ↑ "73 Tantalum". Elements.vanderkrogt.net. Retrieved 2008-09-12. ↑ "46 Palladium". Elements.vanderkrogt.net. Retrieved 2008-09-12. ↑ "58 Cerium". Elements.vanderkrogt.net. Retrieved 2008-09-12. ↑ "76 Osmium". Elements.vanderkrogt.net. Retrieved 2008-09-12. ↑ "77 Iridium". Elements.vanderkrogt.net. Retrieved 2008-09-12. 1 2 "45 Rhodium". Elements.vanderkrogt.net. Retrieved 2008-09-12. ↑ "19 Potassium". Elements.vanderkrogt.net. Retrieved 2008-09-12. 1 2 "11 Sodium". Elements.vanderkrogt.net. Retrieved 2008-09-12. ↑ "05 Boron". Elements.vanderkrogt.net. Retrieved 2008-09-12. ↑ "09 Fluorine". Elements.vanderkrogt.net. Retrieved 2008-09-12. ↑ "53 Iodine". Elements.vanderkrogt.net. Retrieved 2008-09-12. ↑ "03 Lithium". Elements.vanderkrogt.net. Retrieved 2008-09-12. ↑ "48 Cadmium". Elements.vanderkrogt.net. Retrieved 2008-09-12. ↑ "34 Selenium". Elements.vanderkrogt.net. Retrieved 2008-09-12. ↑ "14 Silicon". Elements.vanderkrogt.net. Retrieved 2008-09-12. ↑ "Silicon". The Environmental Literacy Council. Retrieved 2016-12-02. ↑ "13 Aluminium". Elements.vanderkrogt.net. Retrieved 2008-09-12. ↑ "35 Bromine". Elements.vanderkrogt.net. Retrieved 2008-09-12. ↑ Landolt, Hans Heinrich (1890). "Nekrolog: Carl Löwig". Berichte der deutschen chemischen Gesellschaft. 23 (3): 905. doi:10.1002/cber.18900230395. ↑ "90 Thorium". Elements.vanderkrogt.net. Retrieved 2008-09-12. ↑ "57 Lanthanum". Elements.vanderkrogt.net. Retrieved 2008-09-12. ↑ "Erbium". RSC.org. Retrieved 2016-12-02. ↑ "Terbium". RSC.org. Retrieved 2016-12-02. ↑ "44 Ruthenium". Elements.vanderkrogt.net. Retrieved 2008-09-12. ↑ "55 Caesium". Elements.vanderkrogt.net. Retrieved 2008-09-12. ↑ "37 Rubidium". Elements.vanderkrogt.net. Retrieved 2008-09-12. ↑ "81 Thallium". Elements.vanderkrogt.net. Retrieved 2008-09-12. ↑ "49 Indium". Elements.vanderkrogt.net. Retrieved 2008-09-12. ↑ "02 Helium". Elements.vanderkrogt.net. Retrieved 2008-09-12. ↑ "31 Gallium". Elements.vanderkrogt.net. Retrieved 2008-09-12. ↑ "The New Metal Gallium". Scientific American. June 15, 1878. Retrieved 2016-06-16. ↑ "70 Ytterbium". Elements.vanderkrogt.net. Retrieved 2008-09-12. ↑ "67 Holmium". Elements.vanderkrogt.net. Retrieved 2008-09-12. ↑ "69 Thulium". Elements.vanderkrogt.net. Retrieved 2008-09-12. ↑ "21 Scandium". Elements.vanderkrogt.net. Retrieved 2008-09-12. ↑ "62 Samarium". Elements.vanderkrogt.net. Retrieved 2008-09-12. ↑ "64 Gadolinium". Elements.vanderkrogt.net. Retrieved 2008-09-12. 1 2 "59 Praseodymium". Elements.vanderkrogt.net. Retrieved 2008-09-12. 1 2 "60 Neodymium". Elements.vanderkrogt.net. Retrieved 2008-09-12. ↑ "32 Germanium". Elements.vanderkrogt.net. Retrieved 2008-09-12. ↑ "18 Argon". Elements.vanderkrogt.net. Retrieved 2008-09-12. ↑ "63 Europium". Elements.vanderkrogt.net. Retrieved 2008-09-12. 1 2 "10 Neon". Elements.vanderkrogt.net. Retrieved 2008-09-12. ↑ "54 Xenon". Elements.vanderkrogt.net. Retrieved 2008-09-12. ↑ "84 Polonium". Elements.vanderkrogt.net. Retrieved 2008-09-12. ↑ "88 Radium". Elements.vanderkrogt.net. Retrieved 2008-09-12. ↑ Partington, J. R. (May 1957). "Discovery of Radon". Nature. 179 (4566): 912. Bibcode:1957Natur.179..912P. doi:10.1038/179912a0. ↑ "89 Actinium". Elements.vanderkrogt.net. Retrieved 2008-09-12. ↑ "71 Lutetium". Elements.vanderkrogt.net. Retrieved 2008-09-12. ↑ "91 Protactinium". Elements.vanderkrogt.net. Retrieved 2008-09-12. ↑ Emsley, John (2001). Nature's Building Blocks ((Hardcover, First Edition) ed.). Oxford University Press. p. 347. ISBN 0-19-850340-7. ↑ "72 Hafnium". Elements.vanderkrogt.net. Retrieved 2008-09-12. ↑ Noddack, W.; Tacke, I.; Berg, O (1925). "Die Ekamangane". Naturwissenschaften. 13 (26): 567. Bibcode:1925NW.....13..567.. doi:10.1007/BF01558746. ↑ "43 Technetium". Elements.vanderkrogt.net. Retrieved 2008-09-12. ↑ "87 Francium". Elements.vanderkrogt.net. Retrieved 2008-09-12. ↑ "85 Astatine". Elements.vanderkrogt.net. Retrieved 2008-09-12. ↑ Close, Frank E. (2004). Particle Physics: A Very Short Introduction. Oxford University Press. p. 2. ISBN 978-0-19-280434-1. ↑ "93 Neptunium". Elements.vanderkrogt.net. Retrieved 2008-09-12. ↑ "94 Plutonium". Elements.vanderkrogt.net. Retrieved 2008-09-12. ↑ "96 Curium". Elements.vanderkrogt.net. Retrieved 2008-09-12. ↑ "95 Americium". Elements.vanderkrogt.net. Retrieved 2008-09-12. ↑ "97 Berkelium". Elements.vanderkrogt.net. Retrieved 2008-09-12. ↑ "98 Californium". Elements.vanderkrogt.net. Retrieved 2008-09-12. ↑ "99 Einsteinium". Elements.vanderkrogt.net. Retrieved 2008-09-12. ↑ "100 Fermium". Elements.vanderkrogt.net. Retrieved 2008-09-12. ↑ "101 Mendelevium". Elements.vanderkrogt.net. Retrieved 2008-09-12. ↑ "103 Lawrencium". Elements.vanderkrogt.net. Retrieved 2008-09-12. ↑ "102 Nobelium". Elements.vanderkrogt.net. Retrieved 2008-09-12. ↑ "104 Rutherfordium". Elements.vanderkrogt.net. Retrieved 2008-09-12. ↑ "105 Dubnium". Elements.vanderkrogt.net. Retrieved 2008-09-12. ↑ "106 Seaborgium". Elements.vanderkrogt.net. Retrieved 2008-09-12. ↑ "107 Bohrium". Elements.vanderkrogt.net. Retrieved 2008-09-12. ↑ "109 Meitnerium". Elements.vanderkrogt.net. Retrieved 2008-09-12. ↑ "108 Hassium". Elements.vanderkrogt.net. Retrieved 2008-09-12. ↑ "110 Darmstadtium". Elements.vanderkrogt.net. Retrieved 2008-09-12. ↑ "111 Roentgenium". Elements.vanderkrogt.net. Retrieved 2008-09-12. ↑ "112 Copernicium". Elements.vanderkrogt.net. Retrieved 2009-07-17. ↑ "Discovery of the Element with Atomic Number 112". www.iupac.org. 2009-06-26. Archived from the original on 2009-12-21. Retrieved 2009-07-17. ↑ Oganessian, Yu. Ts. ; Utyonkov, V. K.; Lobanov, Yu. V.; Abdullin, F. Sh. ; Polyakov, A. N.; Shirokovsky, I. V.; Tsyganov, Yu. S.; Gulbekian, G. G.; Bogomolov, S. L.; Gikal, B.; Mezentsev, A.; Iliev, S.; Subbotin, V.; Sukhov, A.; Buklanov, G.; Subotic, K.; Itkis, M.; Moody, K.; Wild, J.; Stoyer, N.; Stoyer, M.; Lougheed, R. (October 1999). "Synthesis of Superheavy Nuclei in the 48Ca + 244Pu Reaction". Physical Review Letters. 83 (16): 3154. Bibcode:1999PhRvL..83.3154O. doi:10.1103/PhysRevLett.83.3154. ↑ Oganessian, Yu. Ts. ; Utyonkov, V. K.; Lobanov, Yu. V.; Abdullin, F. Sh. ; Polyakov, A. N.; Shirokovsky, I. V.; Tsyganov, Yu. S.; Gulbekian, G. G.; Bogomolov, S. L.; Gikal, B.; Mezentsev, A.; Iliev, S.; Subbotin, V.; Sukhov, A.; Ivanov, O.; Buklanov, G.; Subotic, K.; Itkis, M.; Moody, K.; Wild, J.; Stoyer, N.; Stoyer, M.; Lougheed, R.; Laue, C.; Karelin, Ye. ; Tatarinov, A. (2000). "Observation of the decay of 292116". Physical Review C. 63: 011301. Bibcode:2001PhRvC..63a1301O. doi:10.1103/PhysRevC.63.011301. ↑ Oganessian, Yu. Ts. ; Utyonkov, V. K.; Lobanov, Yu. V.; Abdullin, F. Sh. ; Polyakov, A. N.; Sagaidak, R. N.; Shirokovsky, I. V.; Tsyganov, Yu. S.; Voinov, A. A.; Gulbekian, G.; Bogomolov, S.; Gikal, B.; Mezentsev, A.; Iliev, S.; Subbotin, V.; Sukhov, A.; Subotic, K.; Zagrebaev, V.; Vostokin, G.; Itkis, M.; Moody, K.; Patin, J.; Shaughnessy, D.; Stoyer, M.; Stoyer, N.; Wilk, P.; Kenneally, J.; Landrum, J.; Wild, J.; Lougheed, R. (2006). "Synthesis of the isotopes of elements 118 and 116 in the 249Cf and 245Cm+48Ca fusion reactions". Physical Review C. 74 (4): 044602. Bibcode:2006PhRvC..74d4602O. doi:10.1103/PhysRevC.74.044602. ↑ Oganessian, Yu. Ts. ; Utyonkov, V. K.; Dmitriev, S. N.; Lobanov, Yu. V.; Itkis, M. G.; Polyakov, A. N.; Tsyganov, Yu. S.; Mezentsev, A. N.; Yeremin, A. V.; Voinov, A.; Sokol, E.; Gulbekian, G.; Bogomolov, S.; Iliev, S.; Subbotin, V.; Sukhov, A.; Buklanov, G.; Shishkin, S.; Chepygin, V.; Vostokin, G.; Aksenov, N.; Hussonnois, M.; Subotic, K.; Zagrebaev, V.; Moody, K.; Patin, J.; Wild, J.; Stoyer, M.; Stoyer, N.; et al. (2005). "Synthesis of elements 115 and 113 in the reaction 243Am + 48Ca". Physical Review C. 72 (3): 034611. Bibcode:2005PhRvC..72c4611O. doi:10.1103/PhysRevC.72.034611. ↑ Oganessian, Yu. Ts. ; Abdullin, F. Sh. ; Bailey, P. D.; Benker, D. E.; Bennett, M. E.; Dmitriev, S. N.; Ezold, J. G.; Hamilton, J. H.; Henderson, R. A.; Itkis, M. G.; Lobanov, Yu. V.; Mezentsev, A. N.; Moody, K. J.; Nelson, S. L.; Polyakov, A. N.; Porter, C. E.; Ramayya, A. V.; Riley, F. D.; Roberto, J. B.; Ryabinin, M. A.; Rykaczewski, K. P.; Sagaidak, R. N.; Shaughnessy, D. A.; Shirokovsky, I. V.; Stoyer, M. A.; Subbotin, V. G.; Sudowe, R.; Sukhov, A. M.; Tsyganov, Yu. S.; et al. (April 2010). "Synthesis of a New Element with Atomic Number Z=117". Physical Review Letters. 104 (14): 142502. Bibcode:2010PhRvL.104n2502O. doi:10.1103/PhysRevLett.104.142502. PMID 20481935.